The latest in the acclaimed storybook-music CDs from The Secret Mountain,​ A Gift for Sophie offers a timeless and musically enhanced tale of the transcendence of friendship, focusing on a young girl, her grand-uncle Old Man Tom and her best friend Emilio. Just hitting store shelves this month, A Gift for Sophie features nine songs performed by singers Martha Wainwright, Thomas Hellman, Paul Campagne and Jessica Vigneault that follow the narrated story by actor David Francis. 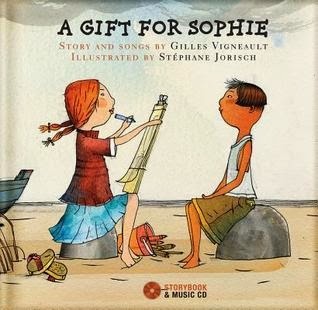 The new picture book-CD set and e-book have been translated from the award-winning French storybook Un Cadeau pour Sophie, which was written by Canadian Singer-Songwriter Hall-of-Fame recipient, Gilles Vigneault, and illustrated by Stéphane Jorisch (who also illustrated the popular Chicken Joe series by Trout Fishing in America). This is a tender coming-of-age story about the friendship between Sophie and Emilio. Their time spent together bring them into the sphere of Old Man Tom, who teaches them a new way to view the world. As author Vigneault explains it, Old Man Tom shows the children “that they have to believe in themselves, in their ability to solve the problems they encounter.” Despite his physical disabilities, and even after his passing, his encouragement and generosity resonate with the young protagonists. The Cd includes the story, read in a wonderful cast of characters! The CD also includes 9 original songs to go along with the story. Songs include With Just one Piece of Wood, Old Tom's House, I've a New Friend. The music is just as exciting as the story! I loved just listening to the music after the story. This is the perfect length for my 5-8 year old children. The story is about 7 year old Sophie and her Great Uncle Tom whom she loved to draw. My 5 year old loved the cat they called "Sir", you can see him doing comical things in each picture of the book. The book was sad for the kids however, as Uncle Tom dies. Tom would have said "It's all the nature of things!". My kids have not had to experience death yet and the story was pretty sad at that point. Sophie kept all of her treasures from Uncle Tom and one day she finds the "Eye" missing. They decide to ask Tom to help them, as he mentioned he would help if the Good Lord allows. Emilio has a dream about the wherabouts of the Eye that he knows must be from Uncle Tom. The book focuses on treasuring your memories and the little things. I really enjoyed it and though sad for the kids at the time, they did end up realizing that Sophie and Emilio had wonderful memories of Uncle Tom. The book also has all of the lyrics to the songs to follow along with. We have probably listened to this CD four times already. They kids are really enjoying the storybook on CD, giving for different voices and extra sound effects. I think it is a great way for the whole family to listen to a story together. Hardcover with CD, 44 pages. CD duration: 33 minutes. Full color illustrations and song lyrics. Recommended ages: 5 to 7. Suggested retail price: $16.95 (US). Also available in Canada.